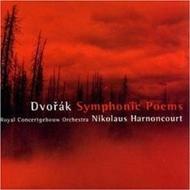 Harnoncourt's collection of Dvoř�k�s four most vivid symphonic poems is one of his finest pairs of records and one of Teldec�s most realistic recordings. The performances offer superlative playing from the Concertgebouw Orchestra, and Harnoncourt's direction is inspired, lyrical and dramatic by turns, ever relishing Dvoř�k�s glowing scoring for woodwinds and, in the famous Spinning Wheel, the horns... The recording and ambience are so believable that one feels one has the famous Dutch concert hall just beyond the speakers.